I’m certain I will eventually find a rhythm on writing reviews of each location, but since this is my first one, bear with me. For this trip, we went with some dear friends of ours (so it was adults only). 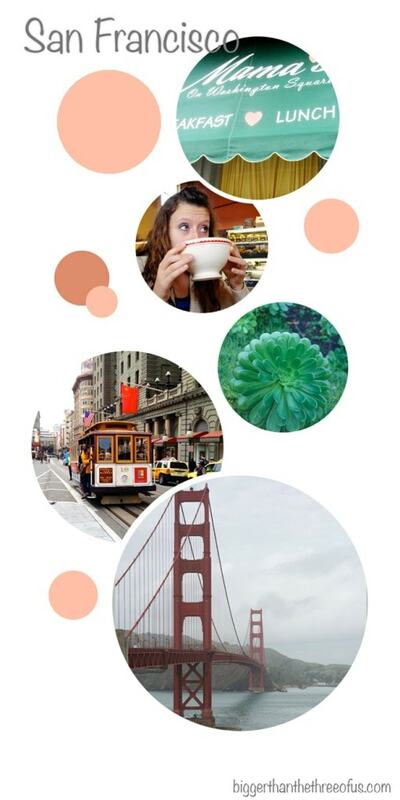 I thought I would share some of our San Francisco Travel Tips with you! 1. Mama’s on Washington : Definitely a must-do for breakfast. Be prepared to wait outside in a line (we waited over an hour), but it was definitely worth it. Everything we got was amazing, and I will even go on to say that this was the best breakfast of our lives. Seriously, that good. 2. La Boulange : We hit two of these over the course of the trip and both were a bit different. Love the fresh baked bread and light meal options. Coffee was good and it was just a fun little pit-stop to take a break from all the walking. 5. Cable Cars / Trolleys / Underground : Definitely ride the cable car and trolley. It’s a fun experience, but more than that, it saves your legs from walking up huge hills. To get around San Fran, definitely do public transportation. The bus system and the underground are pretty easy to navigate. 6. Golden Gate Bridge : What’s a trip to San Francisco without seeing the Golden Gate Bridge? Enough, said. 1. Hobson’s Choice (in Haight Ashbury District) : They pride themselves on being a victorian punch bar. Basically, it’s a dive bar that has huge punch bowls filled with spiked punches. Seriously, the best spiked punch you will ever have. They also have regular bar offerings, but the punch is out of this world. This place is nothing frilly, but for hanging out with friends it’s great. 2. Jamber : This place has a good selection of beer and wine. The decor and vibe were both pretty fun. Nothing amazing, but definitely a good place to hangout for a bit. 3. Cotogna : We went for dinner and this place was amazing! Definitely on my top-3 of all time dinners. Expect to spend $100+ for drinks, appetizers and dinner, but it’s worth every penny. We sat at the bar and got there early (around 5:30pm) and it filled up fast. Next time, I would definitely make a reservation. It’s upscale casual with a fun, vibrant vibe. 4. Food trucks and walking : Part of the fun was just exploring the city. We walked to most of the districts and tried food along the way. I felt like this was the “real” San Francisco. Hope you liked my travel recommendations. As you can tell, we love to eat…so most of this trip centered around that.